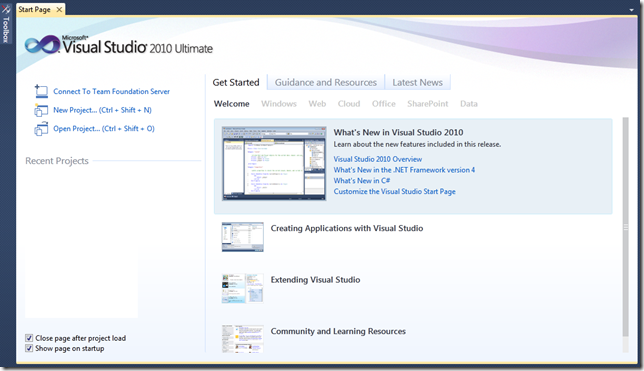 Do you know that you can easily customize the Visual Studio 2010 start page? For example Latest News feed or last project solutions. This uses a XAML page which you can modify easily if you have a knowledge in XAML. Redesign your page with your brand theme and look. Best coding practises your team should follow or you may want to show the pending tasks of the team in the start-up page or you may want to redesign that page with custom templates to meet your company brand. How I can do this? First of all, go to your "My Documents\Visual Studio 2010\StartPages". There you will find a project named "StartPage" with an additional XAML file named "StartPage.xaml". This xaml page is your Start Page of the Visual Studio 2010. Remember that this is user specific file & have to deploy for all users. Before doing anything take a backup of the same. Now open the StartPage project file which will load the xaml in your Visual Studio IDE. Modify it according to the look & feel you want. Save it & you will immediately see the effect in your startup page. Not only this. You can also chose different XAML files for your Startup XAML page. Create a separate XAML file with your design in the same directory as mentioned above. Open your Visual Studio 2010. Go to Tools -> Options -> Environment -> Startup. Also we can make loading Visual Studio a bit faster with making At Startup dropdownlist with "Show empty environment". That will prevent loading of RSS feed of Microsoft last news and Studio will boot quickly. Select the "Custom Start Page" from the drop down that you have created. Hit "OK" to see it immediately in your start page. Remember that for security reason you can't change the path as this executes under the trusted privileges of the user only & also uses some references to the Visual Studio UI assemblies. The Start Page is displayed in the Web browser that is available within the IDE. It consists of a client-side .htm page, in this case default.htm, which contains a list of tabs. These tabs are based on locally stored tab definition files that are authored using XML. When you select a tab, Visual Studio reads the related tab definition file for the tab. If a feed is included in the tab definition file, then the content for the tab is downloaded from a server, as specified in the tab definition file. If the file does not contain a feed, static content is displayed as specified in the tab definition file. All content must conform to the Start Page schema definition file, vstab.xdr, or the content will not render on the Start Page. Rich UI and client-side script are not currently possible for Start Page content. Only a limited set of UI is available, such as links, text, and images. You cannot change the order that tabs appear in the Start Page. Default tabs appear first, then custom tabs, and finally the My Profile tab. You cannot change the content for any of the default tabs provided with Visual Studio. 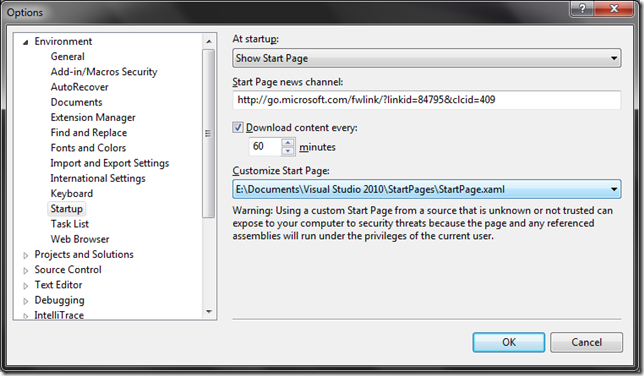 The default location of the StartPage project is your "Documents\Visual Studio 2010\StartPages". If you are not seeing it their then download example below. Also we can add custom content to the Visual Studio Start Page and deploy that content to multiple machines. The content can be static, or you can choose to provide changing content by hosting files on a server. Whichever method you choose, customizing the Start Page is a way to adapt the IDE to your needs or the needs of your organization.